6IX had a remarkably similar beginning to that of TVW Channel 7. Both were conceived and developed by West Australian Newspapers. 6IX started as a company called WA Broadcasters. It was 50% owned by the Newspaper company. The other 50% belonged to the well known Perth music store Musgroves. Incidentally Musgroves is still going strong in Hay St Perth today. Since the eighties, Musgroves has been owned by the Zenith Music Group. 6IX was officially opened on the 27th November 1933 at its first studios situated above the Musgroves shop. It became wholly owned by The West in 1963. 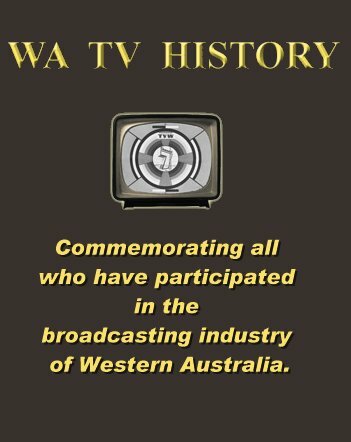 The TVW Story, including its beginnings from WA Newspapers, is wonderfully told by Mr Richard Ashton’s pages on this website. Here is some of the history of The 6IX Radio Network joining TVW Channel 7. Several years before 6IX and Channel 7 were brought under the same roof, there were working arrangements between them. Lloyd Lawson ran a radio version of his Tuesday afternoon show “Today” once a week on 6IX, starting in 1963. In the same year, Eric Walters hosted the 6IX Saturday Night Show. Johnny Fryer made appearances on Lloyd’s Today Show. Miss Lynne Wilson, the Canadian lady who was the 6IX midnight to dawn announcer from late 1964, was a regular panellist on Johnny Young’s time at Club 7’Teen. David Low, in 1968 as well as reading Channel 7 News, he delivered the half hour Midday News Bulletin on 6IX-WB-MD-BY. In 1969, The Herald and Weekly Times took over W.A. Newspapers. The latter by then owned The West Australian, The Daily News, The Weekend News, The Countryman, other smaller newspapers and of course 6IX with its country radio stations, known as WACN (The WA Country Network). Stations in this group were 6WB Katanning, 6MD Merredin and 6BY Bridgetown. Because of Government media ownership laws, The Herald Group had to sell their newly acquired Perth radio station. The Herald already owned 3DB Melbourne. The obvious place for the 6IX Radio Network to go was TVW Ltd. The official change in ownership took place in July 1970. Having missed out on buying The Whitford Broadcasting Network, 6PM-AM Perth and Northam with their country stations 6KG Kalgoorlie and 6GE Geraldton, TVW were very happy. 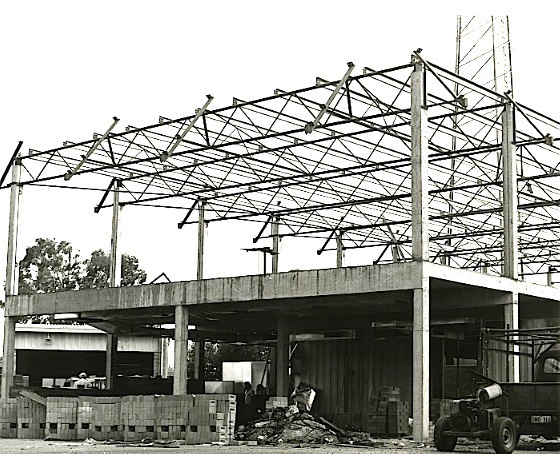 Work on the project began in earnest in 1971. Studios and offices for 6IX were built at the city end of TVW. Mr John Quick was the chief engineer who was in charge of installing the broadcast equipment into the five new Studios, News Booths, Master Control and a Recording Control Room. The cost being $300.000. 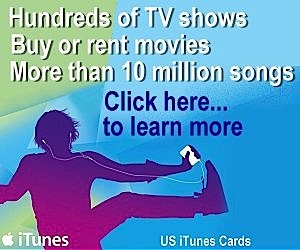 A significant amount then. To prepare, the announcers had to make their way out from the city to the freshly built studios to learn how to operate the new panels on the newly installed desks. At first, announcers complained about the set up,… metal desks, and unable to reach the turntables easily. And there were sliding faders rather than the round knobs they had been used to. With time all became accustomed. Even before the complete move from 38 Mounts Bay Road (home for 6IX since 1958) to Tuart Hill, various operations were amalgamated. News and Traffic were the early departments. In fact, in the early days of the new arrangement, some television personnel came to the third floor of Mounts Bay Rd. to work in the Newsroom, occupied by Newsmen including Ted Gook and David White. One such person was journalist Brian Burke. The first day of broadcasting all our programmes came, I think, in April 1971. Nell Shortland-Jones, followed by Ric Stone, Peter Dean, John Fryer, Leslie Anderson, Peter Barlow, Greg Pearce and Chris Bartlett. Other broadcasters, later heard in the same week included Jan Macafee, our Production Manager Rick Rodgers. This writer was Studio Controller of the Morning Shows. There had been a change in managers. Mr John Hunn who had managed 6IX since 1963, on the retirement of Mr Bryn Samuel (originally a Musgroves man), decided he did not wish to make the move to Tuart Hill. Of course he did later go there and became an important part of Telethon. Mr David Farr was our new manager. Familiar to all from his early days reading the Channel 7 News and taking over from Barry Michael (ex 6KY-NA) The Vox Adeon Nicholsons Quiz Show. Before that the radio world knew David from his announcing work on 6PM-AM. Geometrically he could not have been further from the operations of 6IX. His office was at the top of the stairs at the TVW Reception end. He did a lot of walking! Another 6IX staff man not to make the transition, was Brian Hayes, Announcer and Studio/Production Manager. Brian moved to Europe before settling in England and became a household name on British radio. The BBC among them. As a talk host he was on first name terms with Prime Ministers and many celebrities. Our Sales team included Ron Lucas, who later became 6IX Manager. Gerry Fuller shortly after the move was appointed Sales manager. Elsewhere here, is a lovely picture of the Traffic Girls all dressed in their blue uniforms with, David Dallimore, previously a long serving 6IX announcer going back to the Musgroves days, with his rich smooth voice, and Ian Haselby. Ian later became a newsreader at the then Packer owned 6PM. Technical people in Master Control and around the studios included Don Wood (who had been with the station since the 6ML days), Jim Woods, Jim Hobbs, Roy Rees, George High, Dave Adams and Graham Basden. The Record Library was a busy place, not only for the four radio stations, Channel 7 folk loved having a large supply of music on hand. The library was headed by the late Monty Menhennett (who had compered 6IX breakfast between 1951 and 1959, before Garry Meadows took over, prior to Garry’s first hiring by TVW), Also there were Ruth Elkes (later an announcer on 6PR) and Velia Cometti (wife of Dennis). All this was before the Official Opening of the new studios. The Big Day was the 12th August 1971. It was at 4 o’clock in the afternoon The Lord Mayor (of Tom The Cheap Grocer and Tom’s Other Stores fame), Sir Thomas Wardle officially opened the new Premises. The whole day was a celebration. But for us a lot of hard work and many weeks of preparation. On air that day 6IX took the theme of celebrating 40 Years of radio in Western Australia. The day included broadcasting old news bulletins, putting to air voices heard over many years on IX. Nearly a hundred of the most popular records ever played since 1933 went to air again. Those who did most of the work on these features were our Programme Director Peter Dean, Music Director (the late) Monty Menhennett and Rick Rodgers. 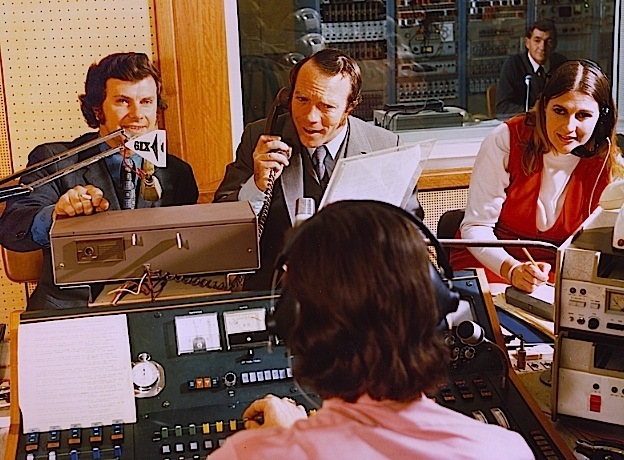 Although 6IX was probably more conservative than other commercial radio stations (a lot to do with the great meticulous Mr Stan Gervas, who had retired in 1968 to open Wallpaper World in Newcastle St.), the announcers were not used to having to wear ties and white shirts to work, or the girls having to wear a uniform. Again, all became used to it in time. Recounting some of my memories I have from those early days include Peter Dean coming up to me and saying “Mr Treasure wants you on Breakfast. He’s been listening to you at night”. That, took me by complete surprise and a little aprehension. Till then I had not even spoken to Brian, but had seen him at the station, heard and read of his achievements, his great abilities, talent and the presence great men have. But first talking to him in 6IX Studio A one morning, his words and help made me respect him even more. Doing Breakfast on 6IX was fun. Our programme was mainly a contemporary based Music Show with half hourly News Bulletins, Traffic Reports from 2 of the bright yellow 6IX TVW News vans, a segment at 7.15 with Bernie Kirwan Ward then later with John Rennie (Rambling with Rennie). Believe it or not The Waterside Workers Roster was read out at 5.45. It was a privilege to work with the newsreaders. They included Clive Robertson, Don Rowe (who was the first to put actual voice inserts in the bulletins), the late Brian Coulter, the late Keith Flanagan, Stuart Joynt, Neil Watson, and Peter Waltham. It was a return to radio for Peter Waltham, having started at 6IX at the age of 18. In 1972 he was reading News both at breakfast on the radio, and in the evening on TV. The ever lively Peter Dean, the talented John Fryer, Monty, the girls: Hilary, Jan, Kerry, Maureen, Trish, Vee and others whose names don’t spring to mind but the faces do! Naturally Channel 7 was keen to use the “supply” of extra voices that suddenly became available. Not for just on camera work, but voice overs for Ads and Booth Work. I can still remember Ann, who looked after Television Promos and Presentation, searching for me to record the night’s announcements. This was one of my duties after finishing the Breakfast Radio Shift. I was usually in the canteen eating an icecream. Some great personalities and radio announcers worked at 6IX then. Of course John Fryer and Peter Dean immediately come to mind with their long lasting highly rated show “Can We Help You”. The Programme had Trish Hancox and Kerry Ryding ably assisting. Other personalities included the late Alan Robertson who had already made his mark before recruited by 6IX, first as an eighteen year old on 6PM, then 6PR and 6KY-NA, the late Sam Kronja (ex 2UE, 2SM, 2CH, 6PM) who was on IX before he became Channel 7 weatherman, (in a later stint he presented the 6IX Breakfast Show Sam ‘n’ Eggs), Peter Barlow, Roger Gascoigne, Murray Jennings (Formerly of 6PR, RCA Records, an earlier stint at 6IX and later the A.B.C.) and Eoin Cameron (from 6VA Albany). Sport played an important part in programming. Football commentaries were headed by Oliver Drake-Brockman and Bob Hicks. Horse Racing from around Australia, with mid week as well as Saturday meetings covered. Local races were called by Barry Thomas. Trotting Races were also broadcast. Our caller was Trevor Jenkins. In December 1972, I was again approached by Mr Treasure. This time he wanted me to become Assistant Programme Director of the station. The family business Zenith Music was growing fast and I needed to spend more time there. After a lovely farewell to full time work, from the team, I continued to broadcast on 6IX on a part time basis. It was too good a time to give up all together. The famous voice of Lionel Lewis returned to 6IX Breakfast briefly. Lionel Lewis had worked at 6IX before, leaving in 1951 to go to the then newest station in town 6KY-NA. Gary Carvolth became Breakfast announcer on 6IX in March 1973, leaving his TV publicity and promotional work to Norman Hayde. These thoughts really only take us up to 1973, where Part 1 ends. I apologise for important names I may have missed, and will make amends in Part 2. Afterall, the 6IX story in being part of TVW started forty years ago! The writer of the above is John Cranfield, who joined the 6IX owned country station 6MD in May 1968, moving to IX in April 1969. He continues to work at Zenith Music, which he owns with his brother Lionel. John has also remained in radio over these years, having recently returned to 6IX to present a Sunday Morning 1960’s Programme. There is so much more of the story to tell. 6MD being sold, Terry Willessee coming…and going, the fire, the eastern states consultants moving in, the late Ernie Taylor’s management time, and of course the end of another era when Holmes a Court took over, then the final chapter with TVW when the radio side was sold to Austereo in 1987. Great to see Cranners posting the 6IX story, although it would’ve been nicer to have some photos which will hopefully be in Part 2. I reckon 6IX lost it’s soul when it was sold to Austereo ad never recovered, though some said the rot st in after Yorkie joined. I do hope 6IX will mark the event this Friday by playing some old jingles etc and thayt John will do a feature on his Sunday Morning show. Thanks for the mention in amongst all those great names from a wonderful radio era. I was priviledged to work with many of the greats both in front and behind the microphones at 6IX & TVW. With the training I had there I came back to New Zealand and enjoyed spectacular success over here in the 70’s & 80’s. I still do a little ‘hobby radio’ on Radio New Zealand National and find myself thanking those folk you’ve mentioned for such a great grounding. Look forward to reading what happened after I left in 1973. My Grandfather is John Rennie (Rambling with Rennie). Would be nice to hear a bit more about what the segment was about and maybe some pictures at some stage. could you tell me if lional lewis ever called races on 6ky-na after he left 6ix in 1951 or if that station ever broadcast horse races at all. Thanks so much for pulling all this together into one (well two) cohesive records of the early days. There are certainly some pioneering names in there, archival records are important! Looking forward to part two… look out! here comes Tedd Bull & ….. Yorkie!! Great to read and facinating to remember. I’m looking forward to the next chapter. Also hi to all the names I see. 6WB will turn 75 next year. Look foward to part 2. Good job! I am a tiny bit disappointed not to find myself mentioned at 6IX, nor Nightline, but I guess you cant remember everything. What briliant website, well done! A lot of familiar names I wonder what they are all doing now? Thanks for getting it started, John. But Don (Douglas) Gresham’s right; there’s more to be told. Other names…Jeff Jeffrey, Monty Menhennet, the late Bill Angwin and Des Austin to name but four. I’ve got two or three stories. I’ll leave out the bits that could have me sued, but one in particular makes very interesting reading. It shows me up as a drongo, but it was fun once the hangover was gone! Remember Hermann Voigt? I loved my (two) stints at 6IX (1967-69 and January-March 1972), especially the first two years. ‘Monty Menhennett’ Wow, such a pleasure to read, and remember, many of the names mentioned above. As a little girl growing up with a “Daddy in the wireless”, old photo’s of Dad, on the air, now come to mind. Good job. Thank you John for trying to record (excuse the pun) the early days and thank you Murray for mentioning my Dad Monty, he truly loved Radio. John, I just found this site by accident and hope that you have done (or are doing), part 2. Radio was such a huge part of our lives before TV, and it was great to see all the old names mentioned. I know Gordon Elliott came later, but used to see him on TV here in the States, and think of him on Perth radio. For me, radio was never the same after Alan died, but we have wonderful memories of all of you. gREAT WORK cRANNERS, yOU WERE ALWAYS AN INSPIRATION TO ME 69-73 AND DIDNT WE STRUGGLE WITH THAT DREADFULL “aUTO-cUE” SYSTEM FOR COMMERCIALS. rEGARDS, pETE hALE. As a teenager I was in TVW 7 marching girls team, Yokine Televettes. Recently met Ric Rogers,bringing back memories of a friend of Ric Stone. I did the “Jolly Jim, Midnight till Yawn” Show in the mid 60,s. Peter and John had their show and Mike Diamond was also there along with Des Austin. Ken Hill hd the evening show and I came on after him. They were really fun times and great listeners. I am writing a history book on the Applecross Junior Football Club. Oliver Drake Brockman was a past President and Life Member. I am seeking any images of Oliver. Some great memories John. I remember doing traffic reports for your breakfast in those “yellow” vans. Sad to hear about Peter Deans passing. Looking forward to pt2. Thanks for this John, Interesting note, my dad, Monty was on air at 6ML (Musgroves) when it caught on fire. He claims he read a news bulletin about Musgrove burning before he realised he was in the building. So many familiar names. People I grew up with. I can’t wait for part 2. You have done an amazing job John putting all this information together. There are so many stories, maybe we should all write them down. It was great to catch up with you at Peter ‘s funeral, Peter would have been thrilled at the amount of people there. I hadn’t seen some people for a very long time….John Price, Trish Hancox, Greg Pearce,Jamie Martinovich, Annie Martin, Di Prezlocha. I was only 16 years old when I started working for 6IX in Mounts Bay Road in 1970….a lot of water under bridge since then. Well done John. You have been one of the best historians of the W.A .media and your on air contribution was a highlight of my days at 6ix and Channel 7. My time spent there will always hold pride of place in my career. I have a copy of “THE GOLDEN ERA SKY-NA” From my grandfather all signed by an old felt tip pen, Lionel Lewis, Eric Fisher, Norm Manners, Kieth Taylor and Buddy Clark. There’s a new golden era in the west. Listen in here the sound of Perth city,,, the sound of 6KY-NA, the sun spot in the West. would like to know more ????? anyone please ill put a pic on my Facebook page ? the effort. He has also offered to speak with you and reminice of the good times. Is John Fryer still alive? Where is he? What is he up to these days? Well done Cranners. Fond memories of the first nightline programs on 6IX in the early 70’s before the delay system. All the incoming calls were recorded on reel to reel by the Engineer in the control room by George High, Dave O’Brien, Don Woods,Jim Wood or Roy ? who later became the TAB results man as well and kept us on our toes making sure we got the dividends correct. It was seat of the pants stuff. While we recorded the interviews “Off Air” we had to make sure whatever music we played “On Air” didn’t run out before the interview ended. Then rewound ready for replay. Dead air nightmares loomed large. Fast learning curve for new announcers from the bush. Greg Pearce and Doug Greshem also took it on.. This is very interesting and took me back to those good old days. I remember so many of the people mentioned. Would you know where I could find some images of Craig Balmer who was a photographer in early West Australian television?